Every session since I have been Lt. Governor, I have issued a list of 30 bills that I identify as top priorities. The list is built around what I have heard from you and the people of Texas. It includes legislation that is needed to support our strong business climate, our conservative principles and our Texas values. The priority list also includes legislation that is brought to me by other senators who are responding to Texans in their districts. These priority bills aren’t the only important legislation that must be passed this session. I am working on many issues. 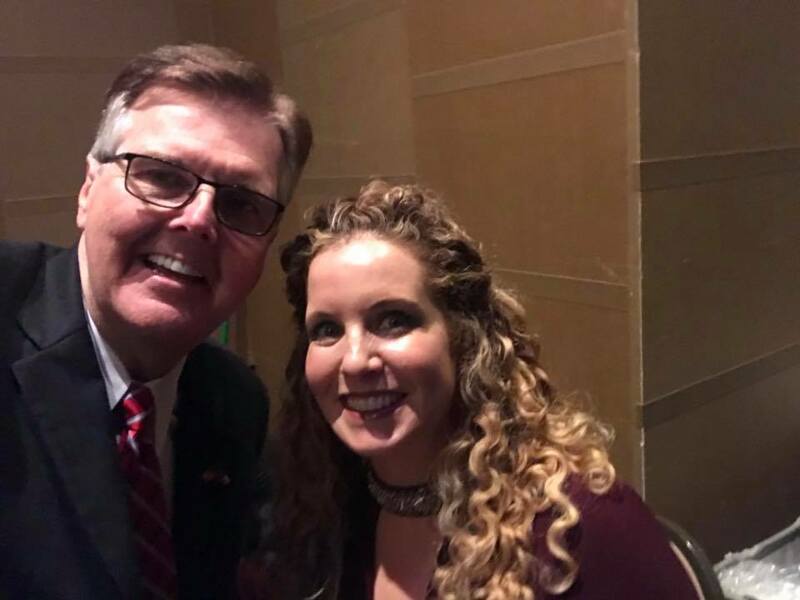 But when the filing deadline was reached on Friday, 2,440 had been filed in the Texas Senate and the top 30 priority list helps me focus on issues that must be addressed. In my first two sessions as Lt. Governor, 99% of our priority bills passed the Senate, with many becoming law. The list always begins with a conservative state budget – Senate Bill 1 — that spends taxpayer dollars wisely and keeps our government lean and efficient. 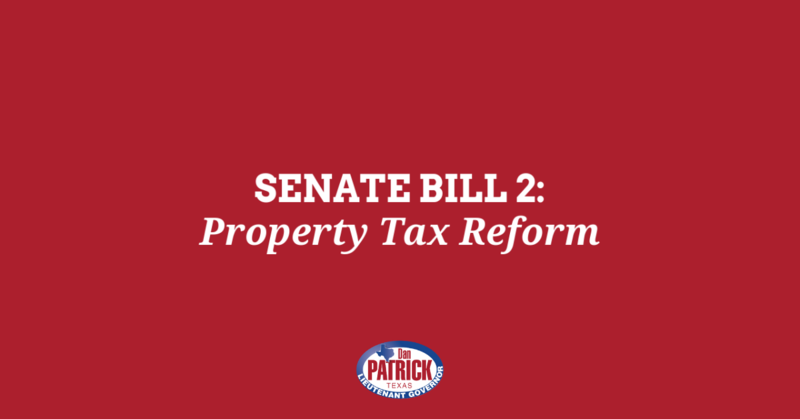 Senate Bill 2, property tax reform, remains my top legislative priority. Except for the local officials who want to continue to raise your property taxes, everyone in Texas agrees that property taxes are too high. I am committed to finally reining in the growth of skyrocketing property taxes once and for all. Senate Bill 2 will require a vote of the people anytime a local entity wants to increase revenue by more than 2.5%. Senate Bill 3 – a $5,000 across the board pay raise for teachers – is also a priority for me. We conservatives have been saying for years that we want more of the money that the state spends on our public schools to go directly to the classroom. There is no better way to accomplish that goal than providing funding directly to teachers. Aside from a parent, nothing has more impact on the success of a child in school than a teacher. Senate Bill 3 has already passed unanimously out of the Texas Senate and I am determined to move it forward and get it signed into law. In addition to the state budget and property tax reform, I am supporting legislation to further protect taxpayers from skyrocketing property taxes and government overreach at every level. I have made increasing the homestead exemption to $35,000 a priority as well as reining in government overreach by requiring the state to pay your attorney fees if they go after you for a frivolous regulation violation. We also want to require that taxpayers get all the information they need when they are voting on local bonds– including how much the city or county already owes in bond debt and how much the bond will cost in interest. I have also included several priority bills that are essential to make sure Texas can fully recover and rebuild from Hurricane Harvey. 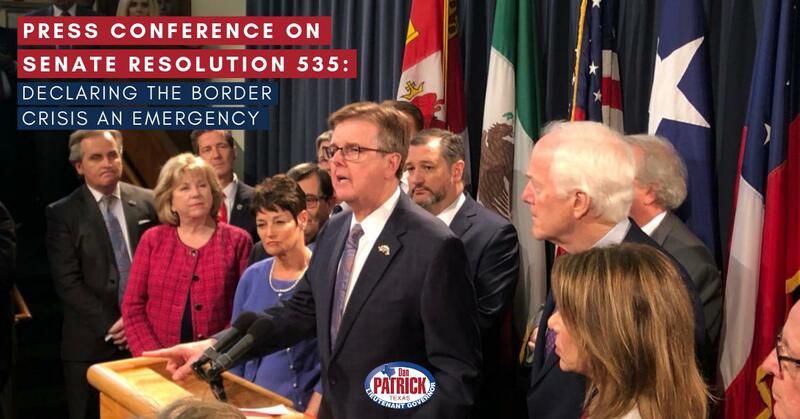 Senate Bill 6, the Disaster Response Act, reflects our work since Harvey in what was done right and what we need to do better in the next disaster. The Flood Disaster Matching Fund and the Statewide Flood Plan (Senate Bills 7 and 8) is a $3 billion dollar package from the Rainy Day Fund that will help us secure federal dollars for rebuilding as well as shoring up earthen dams throughout the state against flooding in the future. Senate Bills 10 & 11 are a response to the school shooting last year and include funding for mental health programs for youth – the top request of parents following the shooting – as well as funds to assist schools in hardening entrances with metal detectors and wands. We also have established programs that will allow teachers and other school personnel who want to to be armed and trained to defend themselves and their students against active shooters. For the complete list of my 30 priorities click here. Liberals and the left-wing will be fighting against these priority bills every day. Since the Texas Capitol is in Austin, they have an easy time mobilizing big crowds of opponents who make a lot of noise. Don’t let them drown out the truth – that the conservative majority of Texas wants our state to stand strong. Liberals are also filing a great deal of far-left legislation that is taken seriously by the mainstream media and Austin insiders. There are bills to rollback sanctuary cities, voter ID, our protections for human life and the Second Amendment. And, of course, there is legislation to spend billions of your taxpayer dollars with no accountability. Let your voice be heard and make sure lawmakers reject these liberal bills. The future of Texas — and the future of America — depends on it. Thank you for your support and for all that you do. P.S. You can follow any piece of legislation in Texas by going to the Bill Look-up Here.